Anyway, we start with Jolson as a boy and played as a boy by Scotty Beckett. In fact, at this point in his life, he’s not even named Al Jolson, but Asa Yoelson. He sings with his father (Ludwig Donath) in synagogue but is privately fascinated with show business. One day, while watching a show, the performer, a guy named Steve Martin (William Demarest) asks the crowd to sing along and only young Asa does. He stuns the crowd, and Steve wants him in the act. Both Asa’s father and mother (Tamara Shayne) protest, and Asa runs away to Baltimore to be in the show. Of course he’s not successful in running away, and his parents come to collect him. He says he’ll keep running away if they won’t let him into show business, so they relent, and off he goes, touring with Steve. Soon enough, his voice changes and he switches to whistling, and also changes his name to Al Jolson. Success follows when he goes on stage for a drunk Tom Barron (Bill Goodwin), who performs a minstrel act. Jolson is discovered and moves on at the insistence of Steve. Success follows, although he leaves that show when he discovers jazz. Jolson knocks around for a bit until Tom Baron, now a theater manager, hires him, and Jolson is an immediate hit. Success follows success, but Jolson seems unhappy. Eventually he finds Julie Benson (Evelyn Keyes) and the movies find him for the first talkie. Jolson ends up married to Julie and the biggest entertainment star in the country. But the success can’t last. Julie is tired of working in movies and Al won’t stop until she puts her foot down and sends him into a sort of retirement. I’ll stop here, although there’s more in Jolson’s life after he and Julie move out to the country. The first thing that needs to be known is that The Jolson Story takes some serious liberties with the man’s life. First of all, Julie Benson is a fiction, but is based on Ruby Keeler, who refused to let her name be used in the film. And, Ruby Keeler was Jolson’s third wife, so the idea that he was some sort of rolling stone before this is clearly fictitious as well. Second, the elephant in the room really does need to be discussed here. 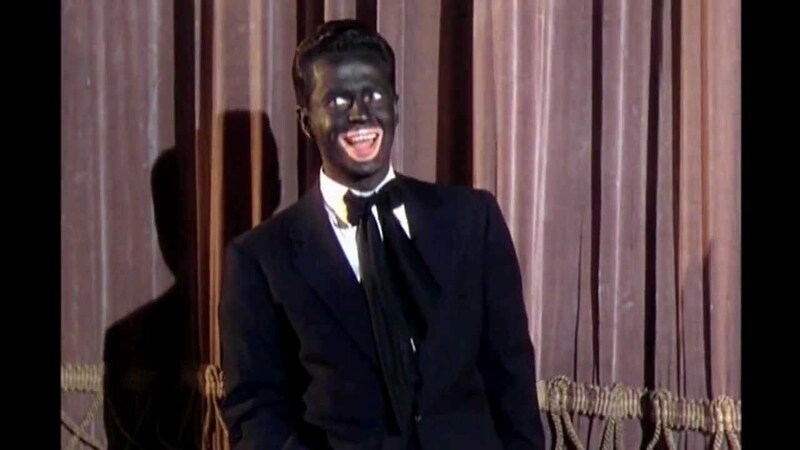 A lot of Jolson’s performances happen in blackface. To modern sensibilities, it’s almost impossible to view this as anything other than overtly racist. An argument can be made that it wasn’t intended that way, but regardless of intent, there are some significant issues with a white performer wearing blackface and making a career out of the songs and mannerisms of a group of people who were clearly in a subservient and oppressed role in society. The film doesn’t shy away from placing Larry Parks in the makeup because it’s necessary, but it’s very uncomfortable. One thing that is interesting is that while Larry Parks is performing the role, it’s Jolson really doing the singing, and the recordings are new ones. Parks looks like he’s singing because apparently he was; Jolson was simply dubbed over him. Truthfully, Parks is better in the role when he’s not on stage. Based on this film, Jolson’s stage persona involved a lot of fourth wall breaks. His singing mannerisms appeared to be standing in three-quarter profile to the audience and simple switching sides back and forth and sometimes rolling his eyes. William Demarest (who was nominated in a supporting role) and Ludwig Donath are the real stars here for my money. As a piece of history, this is interesting, and for what it’s worth, Jolson’s career was an important one. He’s pretty much forgotten these days, more or less a victim of the minstrel shows that made him famous. It’s hard to admit to listening to a guy who got famous that way, even if some of the songs are pretty good and Jolson is still in good voice. Unexpectedly, The Jolson Story was a surprise hit in 1946 and completely revitalized the career of Al Jolson. That being the case, it’s not terribly surprising that in 1949, a sequel of sorts was realized as Jolson Sings Again. Impressively, the main cast of the first film all agreed to come back for the sequel, although one member of the cast was essentially written out based on the end of the first film. Jolson Sings Again picks up literally at the end of the first film, starting on the same night that the last film ended, just a few minutes later. To discuss this, I have to spoil the first film a little, so brace yourself. Jolson returns to the stage, and is truly happy once again, and seeing this, Julie walks out of his life, no longer willing to be the barrier between him and his first love. But the stage bug seems to have passed Al by a bit, and instead he spends his time and money traveling, buying racehorses, backing fighters, and more. Eventually, his mother dies while he is away, unable to attend the funeral. This is around the time World War II is starting, and Al is at an impasse. Steve, now his manager, is working for the military, lining up acts to perform overseas for the troops. Al, not really convinced that anyone will want to see him now that there is a new crop of singers, reluctantly joins up as an entertainer, and becomes fully committed to it thanks to a meeting with Colonel Ralph Bryant (Myron McCormick), an old fan and someone who happens to work in Hollywood when he’s not manning a military base. Jolson tours and entertains the troops until he collapses and winds up in a hospital where he is tended to by Ellen Clark (Barbara Hale). Of course romance blooms, and as soon as he can, Al Jolson is back entertaining the troops until another collapse and surgery that removes part of a lung. Now fully sidelined, Jolson feels forgotten, needing to beg to be a part of a benefit concert that would have had him headlining in previous years. And here’s where things get weird. One person at the benefit is Ralph Bryant, no longer a colonel and back in Hollywood. Seeing Jolson on stage gives him the idea of making a movie about him and having him re-record his old songs. Yes, with a good half hour or so left in Jolson Sings Again, we get a shortened version of the making of The Jolson Story. This includes Larry Parks as Al Jolson meeting Larry Parks as Larry Parks in what might be the first split-screen scene of its type in Hollywood history. This is such a strange movie in so many ways. It honestly feels completely unnecessary and completely self-referential. It appears to have been made to capitalize on the first film, but it also feels at the end almost like propaganda for the first film. At least the blackface is gone for most of it—it does come back at the end when we get the making of the first movie, giving us the odd scenes of Parks as Jolson coaching Parks as Parks in how he should look on stage. Where the first film here is an at least partially realistic document of a now-forgotten entertainer, the sequel feels sort of like a cash grab. Oh, it’s still Jolson singing and still Larry Parks mugging for the camera, but it feels a lot flatter and a lot staler. The first one is interesting; the second seems like a lot more of the same, and feels like only about a third of it adds much to the story being told. Why to watch The Jolson Story: You should see Larry Parks in his best role. Why not to watch: Most of the performances are really, really racist. Why to watch Jolson Sings Again: At least the blackface is gone for the most part. Why not to watch: Holy crap, does this go down a rabbit hole. "And here’s where things get weird. One person at the benefit is Ralph Bryant, no longer a colonel and back in Hollywood. Seeing Jolson on stage gives him the idea of making a movie about him and having him re-record his old songs. Yes, with a good half hour or so left in Jolson Sings Again, we get a shortened version of the making of The Jolson Story. This includes Larry Parks as Al Jolson meeting Larry Parks as Larry Parks in what might be the first split-screen scene of its type in Hollywood history." This is the sort of meta that almost makes me wish Spike Jonze would do a remake. It descends into this weird thing that was particularly surreal, having just watched The Jolson Story. It was like taking a time machine trip, but going just a couple of hours. 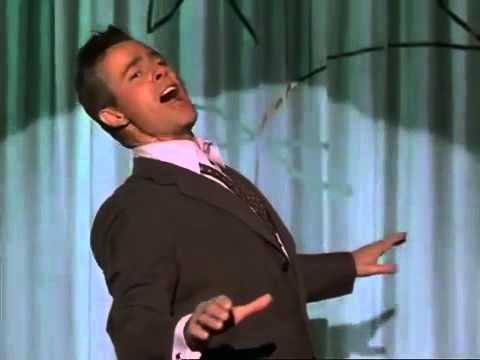 I watched the first out of curiosity having seen The Jazz Singer and not quite understanding what all the hoopla was about since my impression from it was that Jolson was a prancing windbag. But to be fair The Jazz Singer has a plot with whiskers on it so I thought that might have something to do with it. The film did nothing to dispel my first impression and I discovered Larry Parks is a performer that I don't care for (though my heart still goes out to him since he got such a raw deal). His over-eager golly gee mugging quickly became irksome. My enjoyment was also not helped by the whitewash they put Jolson though. I had my suspicions that they would be prettying up the facts knowing that Ruby Keeler wouldn't allow her name to be used, their divorce had been extremely acrimonious, and they didn't make him a plaster saint but from what I've read he was a rather odious man with a wide vicious streak. According to Robert Wagner's bio Barbara Stanwyck had a mark on her chest where Jolson had burned her with a cigarette during a fit of anger when they had been briefly involved during her early Broadway days. Impossible that they would have gone to showing that extreme in the 40's but to make it seem his greatest flaw was his ambition seems a cheat. He was very influential in bringing jazz and other forms of music to the masses but the film didn't really focus on that either. His use of blackface while doing it didn't bother me since it's historically accurate (unlike so much else in the film) and while it was wrong he didn't mean it in a demeaning way but used it to introduce music that he admired. After suffering through the first it took quite a while for me to break down and watch the second but I was on a bit of a Barbara Hale kick, I enjoyed her but the film was lame. Yeah, I kind of see all of this. I said above that Parks is better in the role when he's not on stage, but I really don't like him on stage at all, so that's pretty faint praise. And yes about the blackface. It is, by today's standards, racist and awful, but it was incredibly common for the time period, and plenty of major performers did a minstrel number or two. That it was accepted doesn't excuse it, but it is worth noting that it wasn't parody.